Welcome to the Music and/as Process Study group website. 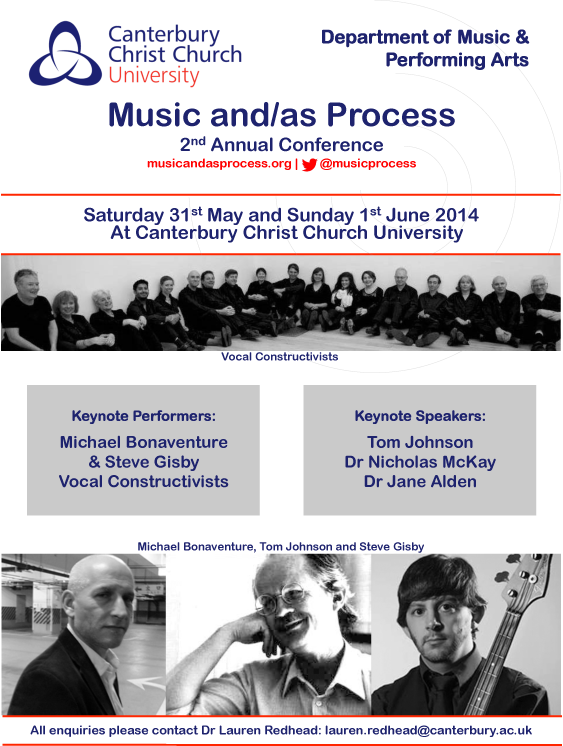 We are very pleased to have hosted the 2nd Annual Conference, which happened on 31st May-1st June 2014 at Canterbury Christ Church University. Conference programme now available to download! Click on the ‘Programme’ link to download the pdf file. You can now sign up for the conference meal – including a drink and entertainment! First come first served. Click here to go to the Canterbury Christ Church Online Shop. Registration is now open! Click on the ‘Registration’ link to go to the Canterbury Christ Church Online Shop. Please contact Dr Lauren Redhead lauren[dot]redhead [at] canterbury.ac.uk if you have any specific enquiries. Programme details will be added shortly.